Members of Covington’s Public Works Department put together the spine of the floodgate that will block the Madison Avenue floodwall gap and hold back the rising Ohio River. COVINGTON, Ky. — Parks and Facilities Supervisor Brad Schwenke picked up a 10-pound sledgehammer and gave the steel stanchion three hard blows. The 2,000-pound A-shaped piece of frame — the fifth of six that form the spine of the Madison Overlook floodgate — was wedged at an awkward angle between the two stubby posts that were supposed to anchor it to the pavement. It was time to start again. Urban Forestry Supervisor Jason Roberts pointed in the air, the operator from Decker Crane Service lightly pushed a few levers, and the stanchion was lifted back off the ground. 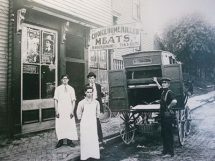 As it was lowered a second time, a half dozen sets of hands were waiting to guide it into place, and with the leverage of a spud bar giving it a final kick inward, the frame slid into place. Such was the activity at the foot of Madison Avenue in Covington on Monday. 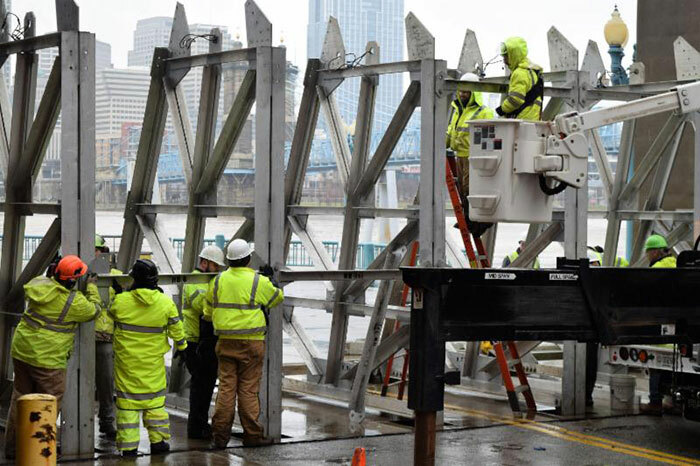 As the Ohio River rushed by, churning with flood debris, about 15 members of the Public Works Department slowly pieced together the floodgate that will seal off the rising water at the biggest gap in the Covington flood wall. 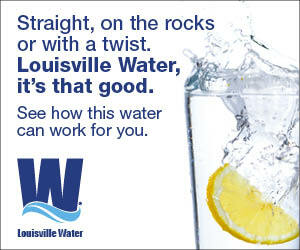 It’s the first floodgate to be erected when the Ohio and Licking rivers start to rise. 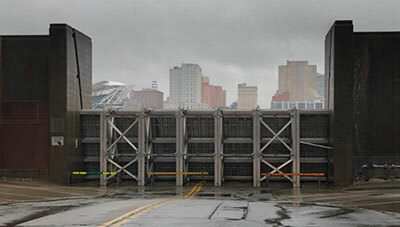 The decision to erect the gate was made Sunday afternoon, when forecasting centers predicted that the on-and-off rain would push the river past 56 feet come Tuesday night. All along the edges of the Ohio and Licking rivers, the water’s level continues to inch toward magic numbers that will trigger various flood protection measures. Flood stage for the Cincinnati pool is 52 feet, and with the river at 51 feet Sunday it had already covered the parking lot below Riverside Drive and was lapping at the edges of the lot underneath the Roebling Suspension Bridge nearby. Sawhorses and other barriers stood ready to be set up to block access to Riverside Drive, River Road to the west and other streets, Davis said. And should the river reach 58 feet, Public Works will install the next-in-line floodgates: at 16th Street to the east and at the foot of Bakewell Street (a la Pete Rose Pier). The floodgate looking from “inside” (north from the foot of Madison Avenue). As for how the Madison Overlook floodgate was built, think of a giant version of the children’s K’Nex construction toy set, with each piece carefully bolted, pinned and slid together, some (obviously) more easily than others. Step 1: Remove the metal plates that cover the footer holes, clean out the holes and install the anchors. Step 2: Drop in and pin into place the six A-frames. Step 3: Bolt the frames together with small steel beams. Step 4: Slide in the panels, 11 on the bottom row and, if needed, 11 on the top row. Step 5: Seal the panels with rubber gaskets. Step 6: Stack 660 small sand bags across the bottom of the first row of panels. “By the time we get to the sand bags, no one is happy,” said technician III Harold “Hector” Klette, describing the long and exhausting day of work. Klette was part of the crew removing the gate’s pieces from a high-ceiling storage room on the north side of the Cincinnati Marriott at RiverCenter’s garage. Some of the pieces could be carried out by hand or with a Bobcat, but the panels and A-frames had to be lifted by the crane through the narrow gap between the garage and the storage building. “It’s not very wide,” Klette said. The Madison Overlook gate — one of seven in the city — was erected twice last year and once in 2015 after not being put up for over a decade. In past years, it took about 10 hours to put together. Monday, it took barely more than seven.